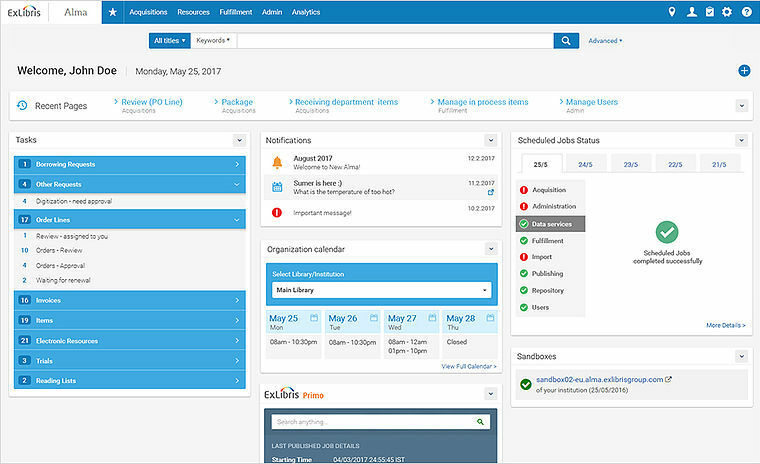 Ex-Libris Alma is a (and the only yet) unified library service platform in the world; It takes care of managing print, electronic, and digital materials in a single interface. As a completely cloud-based service, Alma provides libraries with the most cost-effective library management solution in the industry. Automatic Email Manager is used throughout various colleges, high schools and universities for the use of printing of Alma request, transit slips, receipt, invoice, loan receipt, on any letter or desired document. A local network printer cannot be used to print Alma request, so they are sent directly through an email format. It is very easy to use and works well in the background. "We have increased productivity, easily"
"All documents are routed to the right printer without any effort"
"Magic, no more boring and repetitive manipulations"
Each library/institution defines the email addresses of its local printers in Alma, which route staff-oriented, Alma-originating e-mails (including request and transit slips) to the appropriate printer. Finally you can add conditions to print only specific email. For example, you can add a rule to print the only email with subject 'Resource Request Slip'.